Heat oven to 475°F. In Dutch oven, stir peaches, 3 cups of sugar, flour and nutmeg. Let stand 10 minutes. Heat to boiling; reduce heat. Simmer 10 minutes or until peaches are tender. Remove from heat; stir in butter and vanilla. Remove 2 pie crusts from pouches; unroll on work surface. Sprinkle 1/4 cup of the pecans and 2 tablespoons sugar over 1 crust; top with second crust. Roll into 12-inch round, gently pressing pecans into dough. Cut into 1 1/2-inch strips. Repeat with remaining 2 pie crusts, 1/4 cup pecans and 2 tablespoons sugar. 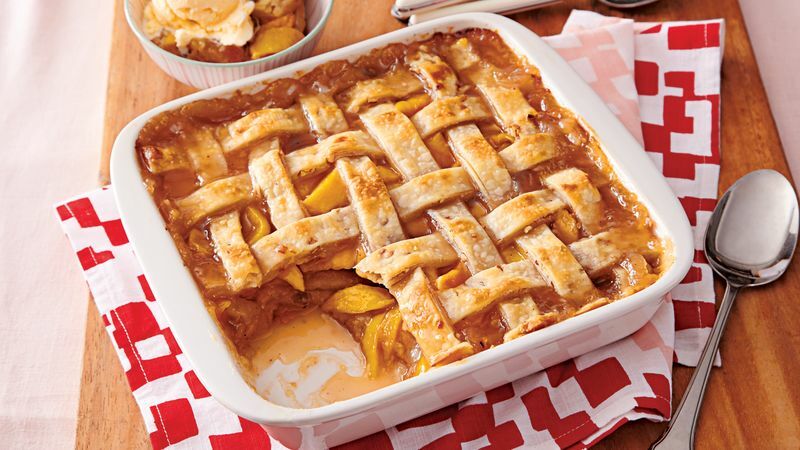 Spoon half of peach mixture into greased 13x9-inch or 2 8-inch baking dishes. Arrange half of pastry strips in lattice design over mixture. Bake 20 minutes or until lightly browned. Spoon remaining peach mixture over baked pastry. Top with remaining pastry strips in lattice design. Bake 15 minutes longer or until filling is bubbly and pastry is lightly browned. Serve warm or cold. To Freeze: Bake as directed; cool completely. Cover baking dish tightly with plastic wrap and heavy-duty foil; freeze up to 1 month. Thaw in refrigerator overnight. To reheat, uncover and bake at 250°F for 45 minutes.